Why Is Ketchup Red and Mustard Yellow? Jason asks: Why is ketchup red and mustard yellow? This most “American” of condiments originated in Asia, where it dates back to the 6th century AD. In the beginning, ketchup (spelled ke-tchup) was a fish sauce – not a sauce for fish, but made of fish . . . well their stomachs, intestines and bladders. Combined with salt and left in a sealed jar to “incubate in the sun,” the original ke-tchup was a far cry from the mass-produced condiment we enjoy today. Europeans were first introduced to the sauce by Chinese sailors in Fuji in the 16th century, although at the time, the condiment had neither tomatoes nor sugar and was frequently just fermented salted anchovies. Today (well, 2007), over 300 million pounds of ketchup are sold each year. There are hundreds of “classic” ketchup recipes, and most involve some mixture of sugar or corn syrup, vinegar, salt, spices and ripe tomatoes. In the United States, other than in heirloom strains, ripe tomatoes are nearly always red. 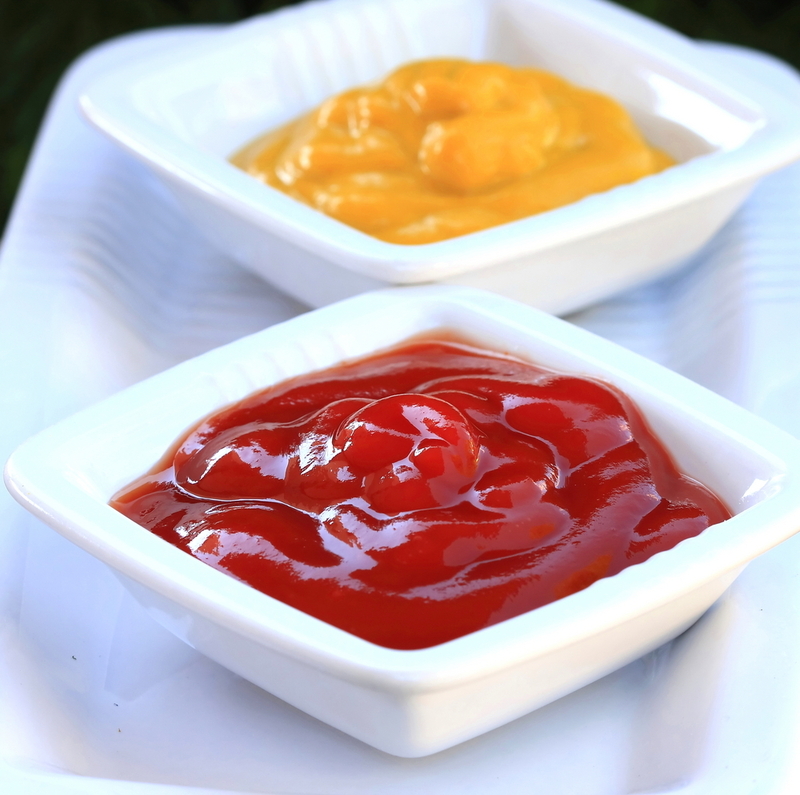 Since the other ingredients in ketchup are either clear, light colored, or present in very small amounts, the dominant color comes from the ingredient that makes up the bulk of the recipe – red, ripe, tomatoes. The tomatoes themselves get their redness from a carotenoid known as lycopene, which becomes the dominant pigment after the tomato has ripened (before that chlorophyll provides the dominate color, making them green). In some countries, like Germany, they love to add curry powder to the ketchup, which can make it more of a red-brown or orange color than the cherry-red of American ketchup. In this ketchup, exotic spices like mustard, turmeric, coriander and hot peppers are added to give this condiment a kick! Said to taste more like chutney, this favorite topping of the Caribbean substitutes bananas for tomatoes, but keeps the vinegar and spices. Fresh garlic is added to the mix for a delicious pungent, salty, sweet and hot yellow condiment. Made by simply adding chipotle peppers and a bit of the adobo sauce they sometimes come in to classic ketchup, this condiment comes with a peppery and smoky kick, along with a brown tint. Gathered before the first hard freeze, green tomatoes make excellent ketchup. This recipe, which adds Worcestershire and honey to the tomatoes, produces a delicious, if greenish-brown, sauce. Designed to have less acid that a traditional ketchup, Nomato substitutes carrots and beets and eliminates, of course, the tomatoes. Nonetheless because of the beets, it retains the classic red color. Mustard starts with the ground seeds of the plant of the same name (which, by the way, also produces edible greens). There are two primary seeds used to make mustard – yellow (or white) and brown (or Asian), though the very bright yellow coloring most Americans are familiar with comes more from another ingredient, which I’ll get to in a minute. Taking the ball and running with it, by the 14th century, French mustard was already famous. It has been rumored that the Duke of Burgundy so loved the condiment made in Dijon, France that he grated the town special privileges. Regardless, mustard manufacturing was sufficiently important by then that it was regulated by the government. Today (well, 2010), French’s Classic Yellow mustard earned nearly $90 million in sales; Grey Poupon, a Dijon mustard, had over $40 million in sales; French’s Horseradish mustard sold over $25 million and Gulden’s Spicy Brown mustard had over $20 million in sales. The recipe for “classic” American mustard has only a few ingredients, including vinegar salt, ground yellow mustard seeds and turmeric. The color comes partially from the yellow of the ground mustard, but in truth this produces more of a dark yellow / brown-ish color. The addition of turmeric is what creates the bright yellow color. Yellow mustard didn’t come along until the turn of the 20th century. In 1884, two brothers by the name of Robert and George French bought a flourmill in Rochester, New York after their previous flourmill upstate burned down. They named the mill the R.T. French Company. When Robert passed away, George’s other brother, Francis, came aboard to help the family business. In 1904, George began experimenting with “creamy salad mustard”. He added turmeric to the traditional recipe for added presentation and color. This bright yellow mustard premiered at the St. Louis World’s Fair in 1904 as a condiment to put on hot dogs to great fanfare and has stuck around ever since. With the addition of honey and mayonnaise to the classic’s recipe, this yellow condiment is sweeter, smoother and richer than the classic. One of the most popular, these mustards are made with brown mustard seeds which often are not as finely ground as yellow seeds. Other than that, they typically share similar ingredients with the classic recipe, although sometimes in different ratios depending on whether the mustard should be sweet, savory or stone ground, and of course lacking the concentration of turmeric which would give it a bright yellow color like the Classic American style if added. Sharing many of the ingredients as the classic yellow, the main difference with Dijon mustard is the addition of white wine to the recipe (and, of course, that it’s made in a particular region in France). Simple and yellow, the primary difference between Chinese mustard and classic yellow is that there is no vinegar in the former. Also, some recipes for Chinese style mustard omit the salt, but add a bit of vegetable oil. For many, mustard doesn’t pack enough of a punch. While some gravitate toward the Dijon or brown, others enjoy the sinus rush that only horseradish can bring. Similar in texture and color to a brown mustard, this tan condiment makes an excellent addition to any deli sandwich. What is in Worcestershire Sauce and Why is It Called That? Kicap (pronounced kee-chup) is the Malay word for soya sauce (and probably comes from one of the Chinese dialect. “Kicap manis” or “sweet soya sauce” – a very thick sweet variety of soya sauce – can be found in Asian grocery stores. The other soya sauces tend not to be labeled as “kicap”, possibly because this particular version is more typically Malay/Indonesian.